Doomtown “In Cahoots” with Millennium Blades! 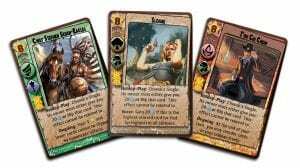 Millennium Blades is a board game from Level 99 Games about a fictional collectible card game, which is also called… Millennium Blades! *You begin the game on pre-release night with just your starter deck. You’ll open new packs, form collections, and sell your junk cards on the aftermarket to buy hot new cards. Trade with your friends, build up your deck, and prepare to compete at Millennium Blades Worlds for the title of World Champion! Doomtown, our*expandable card game set in the Deadlands universe,*is a part of Millennium Blades: Collusion, the “final” expansion for the game currently running on Kickstarter! These Doomtown promo cards feature a keyword called “Holdup” which allows you to rob another player’s Rank Points, or take out one of their singles (their choice). This is based loosely on the call-out mechanic in the original Doomtown. Target high-value cards that your opponent can’t afford to lose in order to make off with their Rank Points! To find out more and to pledge your support, visit the Millennium Blades: Collusion Kickstarter page today!